No matter how bad or how deep the scratches are, we can fix it! 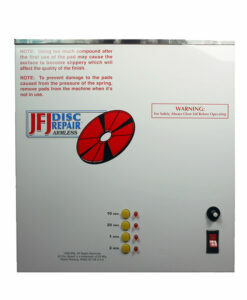 Designed for businesses and individuals who will be doing less than 50 repairs per week.The sanding feature enables the Easy Pro to remove deep scratches, gouges, and even the ring of death from Xbox 360 discs.Easy Pro is capable to do more than 50 repairs per week; however, it has a DC motor with a thermal protector that will shut it down during 20-30 minutes of constant use to prevent overheating.When it comes to repair, it does not matter how deep, or bad the scratches are, JFJ is able to repair it, or your money back! 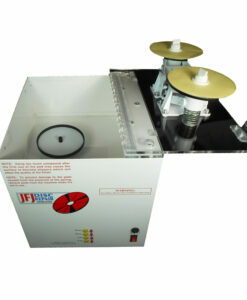 This simple design will fulfill your need for an industrial machine that can repair a large number of discs, and can run 24/7 for many years with literally zero maintenance!These industrial machines may be used as a one-step machine for fingerprints and light scratches, or as a multi-step machine for deep scratches, gouges, and the ring of death (Xbox 360).Both, single and double arm machines come with a 2-year warranty, which covers parts, labor, and even misuse.When it comes to disc repair, it does not matter how deep, or bad the scratches are, JFJ is able to repair it, or your money back!JFJ is built to last like a tank! 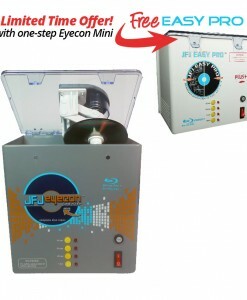 Use the JFJ Eyecon mini for daily use, Blu-Ray repairs, and ordinary repairs. 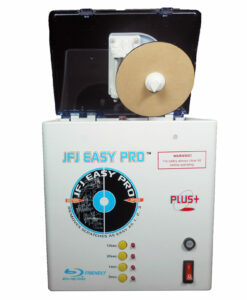 Use the JFJ Easy Pro for gouges and deep scratches that require sanding, and for Nintendo game cube games (supplies sold separately). 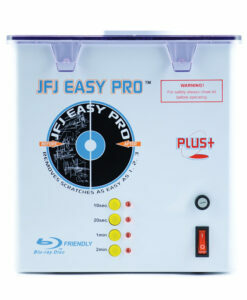 As the market transitions into more blu-ray disc formats(DVD, PS3, PS4, XBOX ONE, & Wii U), we are too, by providing a machine that has the best results for blu-ray repairs.The memory of a blu-ray disc is on the bottom of the disc, so you are only able to buff them.Eyecon is the best solution due to having a more effective, and faster buffing capability than other machines in the market.This machine is a perfect match for Libraries, and video stores repairing a lot of ordinary scratches.Since we know there are old discs that are still valuable, we want the customer to be able to repair those as well, so we are sending a FREE JFJ Easy Pro machine with the JFJ Eyecon machine.You can use JFJ Eyecon for daily activity, and JFJ Easy Pro for deep scratches/gouges. Shop with the confidence of knowing that your order is backed by a 100% Money Back Guarantee. Our 1-Year Warranty covers all parts, labor, and even normal wear and tear. 2nd-Year Extended Warranty is available.